Ever faced the dilemma of what to order at a restaurant? Or perhaps, you just want to savour your favourite dish as much as possible and fill up that plate to your heart’s content. Well, don’t look away, for Chope’s here to dish out your wish! Without further ado, here’s our cornucopia of all-you-can-eats that will have you piling up that plate. Look forward to your favourite childhood treats, prepared with love and care by a team of exceptional chefs. If you can’t get enough of local flavours, you’ll be pleased to know that you can satiate that craving at StraitsKitchen! Sink your teeth into mouth-watering Halal favourites like satay, roti prata, and chilli crab, all in the comforts of an air-conditioned space. Wash everything down with a smooth and milky teh tarik, and make sure you save some place for their amazing desserts, including ice kacang, goreng pisang, and a variety of Nyonya kuehs. This Tripadvisor list-topper certainly earns a 10/10! With a mouth-watering spread of grilled meats and sumptuous Penang hawker-inspired local treats, this buffet has everything you could ask for. Be sure to try their a la carte buffet – unlimited “Plates of Pleasure” carrying morsels of pure bliss. Small tasting portions of delightful dishes are prepared à la minute and served piping hot for maximum enjoyment. You’ll want to try one of everything – all of them will send you soaring into taste bud heaven. Book a table at 10 At Claymore and earn 2X Chope-Dollars with code TASTYBLOG. Get a buffet-licious deal at 10 at Claymore! Taste Singapore’s heritage at The Clifford Pier’s Yum Cha Dinner Buffet and Heritage Feast Buffet. Paying homage to enterprising hawkers in the 1930s who would greet docking ships with steaming meals, the restaurant serves up familiar, comforting dishes like Kambing Soup, Satay, and a decadent Wagyu Beef Rendang. Look out for dim sum trolleys reminiscent of old tea houses as well! Enjoy your favourite childhood treats underneath elegant arches with a view of the bay, perfect for an indulgent trip down memory lane. Book a table at The Clifford Pier and earn 2X Chope-Dollars with code TASTYBLOG. A cosy, casual, and friendly buffet where you can chow down on homely comforts like Hokkien Prawn Noodle Soup and Truffle Mac & Cheese. Nestled in contemporary nature-inspired decor featuring tones of soothing green and brown, you’ll feel like you’re dining in a forest paradise at Lime Restaurant. The big show-stoppers here are their Penang and Peranakan dishes, but you’ll definitely want to save space for the gigantic Matcha Chocolate Fondue Fountain as well. Book a table at Lime Restaurant and earn 2X Chope-Dollars with code TASTYBLOG. Specialising in one type of cuisine or offering a generous spread of foods from every culture, your taste buds will be experienced globetrotters by the time you’re done with these buffets. Taste the four seasons at Basilico, one of Singapore’s best Italian restaurants. The constantly-changing menus are tailor-made to bring out the best of each season, using ingredients that are available during that time of year. Whether it’s light and crisp spring veggies or warm and comforting winter roasts, Basilico is sure to bring you top-notch Italian cuisine, made with only the freshest of ingredients, all through the year. Book a table at Basilico and earn 2X Chope-Dollars with code TASTYBLOG. Expect nothing less than a titillating banquet of sumptuous Japanese-themed fare at Triple Three Restaurant. Featuring a generous selection of sushi and sashimi, a live teppanyaki station and crispy, golden piles of tempura, the buffet has everything you need for your fix of that sweet-savoury umami unique to Japanese cuisine. Take note of weekly themed buffets as well, and be sure to come back for free flow Foie Gras, Kagoshima Wagyu beef, lobster and much more. Book a table at Triple Three and earn 2X Chope-Dollars with code TASTYBLOG. Get a buffet-licious deal at Triple Three Restaurant here! Scrumptious food, classy decor, and amazing views – Town at Fullerton Hotel has it all. On the shores of Singapore River, you can enjoy endless streams of delicious international and local cuisine, all the while admiring the beautiful view and (if you’re lucky) luxuriating in a light breeze. Town’s buffet embodies the mantra of quality over quantity; it has a smaller spread of dishes, but each one is cooked to gastronomic perfection. A themed menu offering everything from local favourites on Monday to grilled meats on Saturday also ensures that things never get boring. Book a table at Town and earn 2X Chope-Dollars with code TASTYBLOG. Let your taste buds travel the world at Melt Café, a swanky restaurant with one of the best buffet spreads in Singapore. Stuff yourself silly with delicious samples of cuisines from every corner of the globe: sashimi, fresh seafood, and juicy cuts of meat. Be sure to explore their extensive Indian cuisine section, where you’ll be greeted with a plethora of curries, kebabs, and tandoori meats that will have you running back for seconds… and thirds… and more. Don’t forget to check out the handmade marshmallows at the desserts section as well! Book a table at Melt Café and earn 2X Chope-Dollars with code TASTYBLOG. Food: Thoughtfully-ourced, carefully served. Mezza9’s short and sweet buffet concept promises (and delivers) a selection of perfectly cooked dishes made with sustainable food sources, for scrumptious and environmentally guilt-free dining. This restaurant goes all out to ‘wow’ diners with open kitchens, a vast expanse of desserts, and an in-house martini bar. Book a table at Mezza9 and earn 2X Chope-Dollars when you use code TASTYBLOG. You know a buffet will be satisfying when it’s got a name like “Food from the Heart”. Serving “level-up” reinventions of global favourites, you can expect to see all your favourite foods from lands far, far, away making an appearance at this buffet. Dishes like Duck and Scallop Noodle Soup (from Sydney’s Bondi Beach) and – get this – a chilli crab sauce fountain. Warm your hearts (and stomachs) in this delightfully intimate setting that will remind you of all your childhood days at grandma’s kitchen table. Book a table at The Kitchen Table and earn 2X Chope-Dollars with code TASTYBLOG. Feast on a smorgasbord of all our local favourites at Colony, all traditionally prepared for an authentic dining experience. You’ll be spoiled for choice with eight conservatory kitchens where skilled chefs whip up your food right before your eyes, presenting you plates of creamy laksa, hand-pulled la mian, and platters of Indian meats cooked in traditional Tandoor ovens. Don’t miss the desserts section, which serves you both classic Western pastries and familiar local treats – we highly recommend the Crêpe Suzette. Book a table at Colony and earn 2X Chope-Dollars with code TASTYBLOG. More Muslim-friendly buffets, isn’t that awesome? AquaMarine is a great choice for those looking to try a large variety of cuisines. With a so many options and so much food, you’ll be finding a new food station at every corner. Their most popular items are the Hainanese chicken rice featuring tender chicken and fragrant rice, chilli and black pepper crabs, and the dazzling array of fresh seafood and sashimi. Besides these, they’ve got Korean, Western, Thai… we’d take more time describing the food than it you would eating it, so head on down now! Click here for more information on AquaMarine. Here’s one for the carnivores! Chow down on juicy premium meats at The Carvery; their tender cuts of pork, heavenly beef slices, and succulent roasted chicken are sure to have you drooling and running back for more. Experienced carvers will turn a hunk of roasted meat into appetising pieces of your favourite cuts right before your eyes, and a range of tasty side dishes and sauces keep the meal from becoming too heavy, so you can just keep eating. Book a table at The Carvery and earn 2X Chope-Dollars with code TASTYBLOG. Get a buffet-licious deal at The Carvery! At the end of a long, tiring week, you’ll want to be pampered, served, and treated like royalty. With attentive servers, gourmet food, and lots of champagne, these buffets are here to make sure you’re recharged for the week ahead. You haven’t truly tasted indulgence until you go for the Champagne Brunch at Brasserie Les Saveurs, an upscale Sunday-only brunch buffet featuring gourmet French cuisine and free-flow wine and champagne. Enjoy succulent seafood, melt-in-your-mouth foie gras, and rich, decadent desserts, all the while serenaded by a live jazz band. With its calm and sophisticated ambience created by soothing music, ceiling-high windows, and elegant chandeliers, Brasserie Les Saveurs will leave you feeling like royalty. Book a table at Brasserie Les Saveurs and earn 2X Chope-Dollars with code TASTYBLOG. Walk into the Colonial era and feel like the royalty when you go to Bar and Billiard for their Champagne Brunch. Hands down one of the most atas buffets in Singapore, Bar and Billiard’s vast spread of delicacies seem to be flown in straight from Buckingham Palace. Tuck into artisanal cheeses from around the world, perfectly roasted meats, and intricate canapes, each one a bite-size piece of paradise. Their crown jewel is undoubtedly the live foie gras station, where you get as much seared foie gras as you could possibly want. Click here for more information on Bar & Billiard. 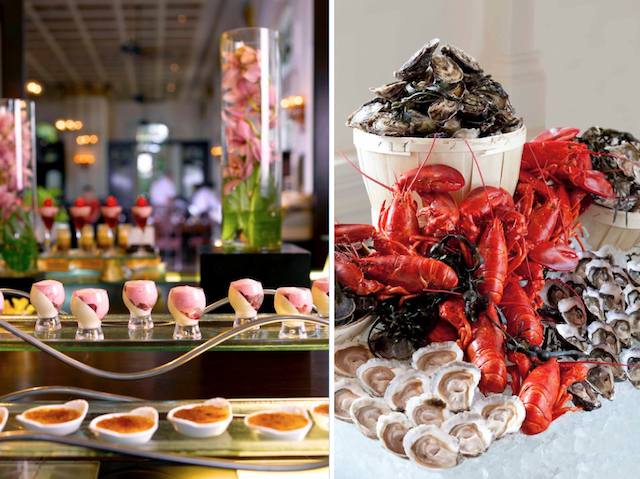 Hilton Singapore’s Champagne Brunch buffet is the very definition of decadence. Eight stations of drool-worthy seafoods, meats and cheeses fill the room with smells that will send your stomach grumbling, including a 6-metre dessert bar where you can find the best cakes, pastries, and desserts from Hilton’s very own D9 Cakery. Other highlights include an artisanal cheese room featuring oozing, melty Raclette cheese, the fresh seafood station with its freshly shucked Fine de Claire oysters, and a grill section where juicy meats are seared to perfection. Click here for more information on Hilton Singapore. This one’s for all the seafood lovers out there who just can’t get enough of scallops, mussels, oysters, and everything that comes from the deep blue oceans – look no further than buffets offering the best of the ocean’s culinary treasures! Get ready for a dizzying array of delights when you dine at Carousel. The buffet has a luscious international menu featuring grilled and roasted meats, sushi, and local favourites, but its fresh seafood and desserts sections are where the restaurant truly shines. Pile your plate high with sweet crabmeat, creamy oysters, and tender scallops, before ending on a sweet note at their chocolate fondue station. Bonus: all the food is prepared in certified Halal kitchens, so our Muslim friends can join the feast too! Book a table at Carousel and earn 2X Chope-Dollars with code TASTYBLOG. There’s always a line at this all-day buffet in Shangri-La Hotel and we can see why: the dishes here are certainly worth the wait. With 16 theatre kitchens where food is prepared on the spot and served piping hot to hungry diners, you’ll be spoilt for choice and wondering where to start. We highly recommend their seafood counter, especially the remarkably large, fresh, and sweet oysters. Their desserts are amazing as well, so remember to reserve your appetite for the stunning array of sweet treats guaranteed to satisfy even the sweetest of sweet tooths. Book a table at The Line and earn 2X Chope-Dollars with code TASTYBLOG. Blurring the line between dining and entertainment, a meal at Edge will have you constantly teetering at the edge of your seat in excitement. In seven live food theatres stand skilled chefs putting on a spectacular (and edible) show, cooking up delectable delights à la minute for your enjoyment. Their signature Pacific cuisine will take you on a journey around the ocean, sampling foods from all around the Pacific region. Book a table at Edge and earn 2X Chope-Dollars with code TASTYBLOG. Get a buffet-licious deal at Edge here! Wow, what a comprehensive list!